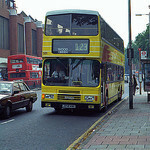 I think the H37 did used to just hesitate at Richmond station then go around the roundabout and back to Hounslow. It could do that again but reliability probably suffered in the past. I believe there was a dedicated stand for the H37, including a Bus Stand flag, almost opposite Richmond Station (close to Carluccios), back in the days when it used to turn around at the Richmond Circus roundabout. I imagine the decision was made to move the H37 to Manor Circus to help ease the always-terrible traffic congestion in the town centre, despite this choice adding surplus pax capacity over the extended section of route. On the subject of the scattered Manor Circus stands, things may become even more complicated in the not-too-distant future. A major redevelopment is planned for the site [links to PDF] currently occupied by Homebase on Manor Road, with both the Homebase and Pets at Home stores being demolished in favour of 384 new homes and a commercial 'town square' area. 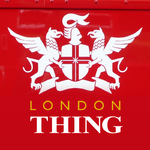 While the current plan is to preserve the small corner of land currently used to stand the 493 and R70, the company behind the development says it's "liaising with TfL" regarding its proposals to redevelop Manor Circus and upgrade the bridge over the railway on which the roundabout sits (those proposals are still officially in post-consultation limbo for now). TfL says it intends to proceed with the Manor Circus upgrades in mid-2020 - and if the new Avanton development eventually gets the green light too, it may well go ahead in a similar timeframe. Both of those projects will surely wreak havoc with traffic and with the local bus network, especially as it's likely that Manor Road will be subject to closure or limited access at various points during the building work, limiting access to stands there. And with the Manor Circus roundabout so close to the bay stands on the A316, stand space there may also be reduced to make way for roadworks and plant machinery associated with those works. We may well see buses temporarily terminating in some strange places! So removing the 493, H22 and 2 bph on the H37 needing to reach that place is probably a good thing to save their reliability. Maybe even the shortened 391 could merge with something (R68/70) to reduce the need to further standing there. Nope, the H37 had a dedicated stand for 2 buses just before "The Orange Tree" facing towards Richmond Circus (there was a rather large tree on the kerb edge that had many a mirrror!). Of course the best solution to the H37 stand issues would be to severly lower the road at Isleworth and run the DD 337 through to Hounslow like the 37 did. Or clear the back street around the bridge of parked cars. Can't see it happening but hey. No not at all. The splitting of the 37 was actually the right thing to do at the time and still is, Figures show the Richmond - Putney section of the corridor is the quietest. I think a route should go up the Kew Road to help the busy 65 . H37 could be ideal for that. Yes I agree with that, the 337 generally is a pretty quiet route. When the rail line it parallels goes down the swanney it goes without saying the 337 gets annihilated. And the typical standard busy peak times. Other than that it’s a quiet route. Rerouting via Busch Corner with something else serving St Johns Road is probably the only viable option, if it weren't for the low bridge the 337 would surely go to Hounslow? I think it would. Of course not the 37 but Hounslow to CJ would not be beyond possible with about an hour journey time. The argument against extending the 337, aside from the issue of the St John's Road bridge, is that the H37 can be a bit of a problematic route in its own right. It suffers from having to pass through multiple traffic bottlenecks - on St John's Road itself (thanks to poorly parked cars down the entire length), at Isleworth War Memorial, St Margarets roundabout, Richmond Bridge, and Richmond town centre - all of which become infinitely worse during peak times. It's a relatively short route, but thanks to those congestion hotspots, it can often take a ludicrous amount of time to travel from end to end, and it's not uncommon to see buses travelling in pairs, or a group of three buses on stand at either end. I agree that the 337 is pretty quiet during the day, but during peaks, it can be a very long, very slow crawl from Richmond to Clapham - it doesn't take much, for example, for Sheen Road/Upper Richmond Road to devolve into gridlock from Richmond all the way to the Red Rover junction at Barnes. I'm not sure that a much longer combined route would improve reliability compared with how things now stand, especially if the route were to be made even longer with a significant extension via Busch Corner. 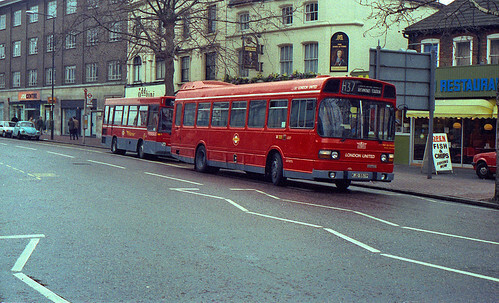 I'd did wonder if the 371 was going to reach that Kew Green Stand and the 391 discontinued once the 306 split happens and TFL claim there are mroe then enough buses along Chiswick High Road even once the 27 is cut. And then add in the Putney to Wandsworth section which also plays havoc with the 37 and it's quite easy to see why any extension would simply not be feasible. 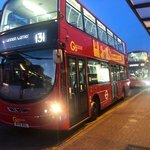 Regarding the 391: I can't see it remaining viable in its revised form for very long, given that massive sections of the route will duplicate existing services (Richmond to Manor Circus covered by H37, R68, R70, 371, 419/110; and Kew Bridge to Chiswick/Hammersmith covered in various chunks by 27, 190, 237, 267). Indeed, the only reason for the 391 to exist at all will be to connect the Sandycombe Road area and Kew Gardens Station to nearby town centres. While those areas undoubtedly need a bus service, I don't see the 'new' 391 as being the best solution, given what a huge proportion of the route will be covered by existing services operating with generous frequencies. Perhaps a further revision could be on the cards in the future - for example, re-routing away from Hammersmith as a terminus in favour of somewhere like Westfield White City. Something like that might prove popular with shoppers in (and visitors to) the Richmond and Kew corridor, while offering a new bus connection between two areas of London that aren't yet directly linked. There's no shortage of routes currently connecting Richmond and Hammersmith, so I think TfL could afford to get a bit creative and take the 391 somewhere other than Hammersmith. But one other possibility might be to axe the 391 entirely and make changes to another route to serve the Sandycombe/Kew areas - let's say... an extension of the R70 or 371 from Manor Circus to Kew Green via the existing route 391 - which would maintain a connection for Sandycombe/Kew to multiple town centres. The costs associated with extending another route (adding vehicles/drivers etc) would surely be far lower than the cost of continuing to operate the 391 as a standalone route that offers few unique connections. Considering TfL's financial position, I can easily see the 'new' 391 becoming a prime candidate for the chop in the next round of cuts. Of course, TfL still hasn't implemented the changes it's already confirmed for the 391. One disaster at a time.